Newspaper Rock: Rob hypocritical about genocide? In Was Jamestown Massacre Justified? reader Stephen cast doubts on my explanation of why the Indians massacred the English settlers. Here are his comments and my responses:Only combat against a legit target is justified; what was stopping the Powhatan from only attacking English soldiers?I don't think we know exactly what happened, but the Indians had killed soldiers before. Apparently that wasn't enough to convince the English to leave. Therefore, I suspect the Indians resorted to what they considered the last resort: the "shock and awe" approach of killing everyone. Not surprisingly, you didn't think too deeply about the issues I raised. Maybe the Indians considered the women and children carriers of disease (i.e, "evil spirits"). Maybe they asked the women to leave and they refused, which would make them accessories to the "crime." Maybe the Indians knew the women and children would die without the men to provide for them, so they killed them out of "mercy." I could be wrong but I don't think they did [try to negotiate, etc. ]; language and cultural barriers tend to make diplomacy hard.If the invaders wanted to negotiate some sort of right to invade, it was incumbent upon them to learn the Indians' language and culture. If they couldn't find a diplomatic solution, the Indians' military solution shouldn't have surprised them. Excuses for mass murderers? 'Grats on making excuses for mass murderers, note the double standard folks; when Natives committ a mass murder it's self defense, when eviiiiil white men commit an atrocity it's evil.Note Stephen's continued inability to read what I wrote, folks. I'll repeat it for those who can read:My position is that violence is justified only as a last recourse, when all other options have failed.I doubt the Indians tried everything they could short of massacring everyone. In that sense they were wrong. But I believe they were acting like people who had been bullied or battered repeatedly. In that sense, I believe they had some right to self-defense. Whether they killed too many people in their all-out military action would require a detailed look at the facts and evidence. In particular, an examination of how realistic the Indians' fear of annihilation was. It would be something for a court to determine then--not for armchair speculators to decide four centuries later. In fact, I bet a court would allow the Indians some sort of "diminished capacity" defense as a result of the Englishmen's ongoing threats and attacks. If so, I suspect the Indians would be acquitted by a jury of their (Indian) peers. If they were found guilty, it would be to a lesser crime or with mitigating circumstances. Except the goal of Jamestown was not to start a war the Powhatan believed this would 'put them in their place' and that the surviving English would recognize the Powhatan as the authority.I quoted Powhatan's thinking once before. I'll quote it again:Chief Powhatan had soon realized that the Englishmen did not settle in Jamestown in order to buy and sell with the Indians. The English wanted more; they wanted control over the land. As Powhatan stated, “Your coming is not for trade, but to invade my people and possess my country.”Your opinion about his goals sounds like just that...your opinion. I quoted what he supposedly said. Let's see you do the same. Butchering an unarmed child is self defense? Slaughtering an unarmed woman is self defense?When the women and children contributed to the theft of the land? When the English could claim they owned the land as long as a single English person occupied it? I'd say yes...killing unarmed women and children could be part of a last-ditch defense. One point you've conveniently ignored is whether the women and children had ample warning of the Indians' intent. I'm guessing the Indians sent a pretty clear message: leave our country or else. If the noncombatants stayed in a potential war zone when they were advised to go, I wouldn't say they were totally blameless. Their deaths may have been tragic and unnecessary, but I wouldn't say they were "heinous." You'd be okay with the massacre if the Indians killed only the English men? If the Indians left the women and children to fend for themselves (i.e., starve and die)? Then go ahead and say so. Quit talking like someone willing to let the English take the Indians' homeland by hook, crook, or force. Permanent settlers = temporary intruders? You're comparing apples to oranges, sure you have the right to kill an intruder, but you do not have the right to kill that intruder's infant child and wife.Which is why I wrote, "I say that if you come across someone trespassing in your house and he's clearly unarmed, you're absolutely not justified in killing him." Good job restating my position. But you're the one who's comparing apples to oranges. In this case, the "unarmed" intruders weren't just coming to steal something and leave. They were coming to stay permanently. It was that moral crime--invasion and conquest--that justified the Indian's last-resort thinking. Again, it didn't justify the actual massacre--I said I don't know if that was necessary. But it justified the thinking that led to the massacre. If you're not too much of an whitebread American, try to understand the difference between explaining what they thought and excusing what they did. Unless you're certain you can divine the Indians' thinking, don't bother braying about the women and children again. Yeah, we got your position. You're an Anglo apologist who doesn't understand what the Indians were facing. Unlike you, they realized the Europeans would never stop coming unless they did something drastic. In other words you're saying they [the Indians] had the right to commit genocide.You don't think I know the definition of genocide? One of us doesn't know it--that's for sure. So you think massacring one small colony of Europeans--about one-millionth of their total population--constitutes "genocide"? Sorry, wrong. Genocide means trying to wipe out an entire race, not a tiny portion of it. Clearly you don't know the definition of genocide, bright boy, since it's not the same as murder or mass murder. I've quoted the definition on my genocide page just for people like you. Read it and report back to us on whether you understood what you read. In fact, you're the only one who's saying someone (the English) had a right to commit genocide. Since you're excusing the English invasion of Virginia, where exactly would you draw the line? Were the Indians ever justified in killing "settlers" who forced them from their land into poverty, sickness, and starvation? If so, when did killing settlers go from being unjustified to justified? Pick a point and defend your position. Nothing like the smell of hypocrisy in the morning.Nothing like the smell of stupidity in the evening. Repeat: My position is that violence is justified only as a last recourse, when all other options have failed. That position is the same regardless of who's committing the violence--whether it's Americans, Nazis, Muslims, or Indians. If you want to discuss some situation where you think Europeans or Americans killed people only after their other options failed, let's do it. But don't waste our time fantasizing that my position would vary depending on who's doing the killing. Put up or shut up with actual case studies, not your ridiculous guesses about what I believe. What did the massacre achieve?Also what exactly was achieved by this horrible massacre?What was achieved by all the peaceful accommodations the Indians made, the hundreds of treaties they signed, etc.? Other than the deaths of 98% of them, that is. Answer that and then I'll tell you why the Indians resorted to massacres when all else failed. I've written about the various ways the Indians could've avoided defeat. They generally involved killing and warfare. The Euro-Americans were never going to give up unless they were forced to. But if you can come up with an alternative, by all means do so. Tell us the nonviolent means by which the Indians could've kept their land. We await your "expert" knowledge of history with bated breath. And while you're at it, be sure to tell us what the Indians should've done at Jamestown. Assume they correctly foresaw what would happen in the next couple of centuries, when the English overran their homes and reduced them to beggars. According to you, they should've laid back and enjoyed it, eh? Below: "I have a woman and child with me. That means you can't fight back, you savage animal." I do not buy any of the justifications for killing women and children. I find every one of them to be flimsly. However, I find it to be flimy any time anyone justifies this. In the My Lai massacre, the perpetrators justified the massacre of the children because they might grow up to be Viet Minh/Viet Cong. I don't find that to be any more flimsy of an excuse than any of these given here for possible Indian justification for wiping out all. "Maybe the Indians knew the women and children would die without the men to provide for them, so they killed them out of "mercy." In accounts of the genocide in Rwanda, I heard this excuse specifically used by a woman who massacred Tutsi children. Wow more hypocrisy; I look forward to future posts about how dresden and hiroshima were justified. Rob apparently believes his favorite race can do no wrong. "I don't think we know exactly what happened, but the Indians had killed soldiers before. Apparently that wasn't enough to convince the English to leave. Therefore, I suspect the Indians resorted to what they considered the last resort: the "shock and awe" approach of killing everyone." "Not surprisingly, you didn't think too deeply about the issues I raised." Maybe the Indians considered the women and children carriers of disease (i.e, "evil spirits"). "Maybe they asked the women to leave and they refused, which would make them accessories to the "crime." That's guilt by association which does not justify murder. Besides didn't you say that guilt by association was a bad argument? "If the invaders wanted to negotiate some sort of right to invade, it was incumbent upon them to learn the Indians' language and culture. 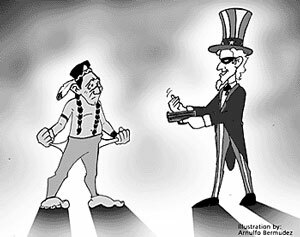 If they couldn't find a diplomatic solution, the Indians' military solution shouldn't have surprised them." Mass murdering innocents is not a military action; it's terrorism. Only violence against legit targets is justified. "I doubt the Indians tried everything they could short of massacring everyone." Got any facts to back that up? If not shut yer hole. "In that sense they were wrong." "But I believe they were acting like people who had been bullied or battered repeatedly. In that sense, I believe they had some right to self-defense. " Of course they had a right to defense they just didn't have a right to kill civilians. "Whether they killed too many people in their all-out military action would require a detailed look at the facts and evidence. In particular, an examination of how realistic the Indians' fear of annihilation was. It would be something for a court to determine then--not for armchair speculators to decide four centuries later." It doesn't take a court to understand that the cold blooded murder of a toddler is f*cked up. "In fact, I bet a court would allow the Indians some sort of "diminished capacity" defense as a result of the Englishmen's ongoing threats and attacks. If so, I suspect the Indians would be acquitted by a jury of their (Indian) peers. If they were found guilty, it would be to a lesser crime or with mitigating circumstances." Ah yes vague speculation; the core of any argument. "When the women and children contributed to the theft of the land?" Once again that's guilt by association. "When the English could claim they owned the land as long as a single English person occupied it? I'd say yes...killing unarmed women and children could be part of a last-ditch defense." By your logic or lack thereof dresden was a-okay. "One point you've conveniently ignored is whether the women and children had ample warning of the Indians' intent." Oh yes the warnings nonsense; that's exactly the excuse the provos gave when the committed the bloody friday atrocity. But guess what? Those warnings didn't mean jack sh*t, because at the end of the day it was the people who planted the bombs or in this case the warriors who killed the civilians who were responsible for the mass murder. "I'm guessing the Indians sent a pretty clear message: leave our country or else." Key word there is guess; even if they did that doesn't excuse it. "If the noncombatants stayed in a potential war zone when they were advised to go, I wouldn't say they were totally blameless." Then by your (anti)logic those innocents who died on bloody friday deserved it. "Their deaths may have been tragic and unnecessary, but I wouldn't say they were "heinous." Oh I see nothing heinous about a warrior slaughtering a baby, you sir are a piece of work. "You'd be okay with the massacre if the Indians killed only the English men? If the Indians left the women and children to fend for themselves (i.e., starve and die)? Then go ahead and say so." I would have no problem with the jamestown incident if only combatants or soldiers had been killed. "Quit talking like someone willing to let the English take the Indians' homeland by hook, crook, or force." I'm afraid you're projecting just a tad. "Which is why I wrote, "I say that if you come across someone trespassing in your house and he's clearly unarmed, you're absolutely not justified in killing him." Good job restating my position." Oh dear I made one small mistake, whatever will I do? "But you're the one who's comparing apples to oranges. In this case, the "unarmed" intruders weren't just coming to steal something and leave. They were coming to stay permanently. It was that moral crime--invasion and conquest--that justified the Indian's last-resort thinking." Uhh no it didn't; nothing ever justifies mass murdering innocents. By your own logic you should also be defending the dresden atrocity like a good lil' anglophile. "Again, it didn't justify the actual massacre--I said I don't know if that was necessary. But it justified the thinking that led to the massacre. If you're not too much of an whitebread American, try to understand the difference between explaining what they thought and excusing what they did." "Unless you're certain you can divine the Indians' thinking, don't bother braying about the women and children again." I'd roll my eyes but those muscles are tired. Yeah, we got your position. You're an Anglo apologist who doesn't understand what the Indians were facing." Uhh no I'm not apologist for the Indian genocide, get your facts straight. "Unlike you, they realized the Europeans would never stop coming unless they did something drastic." Except it's possible to do 'drastic' things without killing innocents; the triumph of little big horn comes to mind. "You don't think I know the definition of genocide? One of us doesn't know it--that's for sure." "Once it was clear that the Euro-American colonizers weren't going to leave, the Indians were justified in using any measure to get rid of them." In other words you're saying the Indians had the right to committ genocide, I wasn't calling the Jamestown massacre genocide rather I was critiquing something you posted. Understand? Or perhaps I need to draw you a flow chart? "Clearly you don't know the definition of genocide, bright boy, since it's not the same as murder or mass murder. I've quoted the definition on my genocide page just for people like you. Read it and report back to us on whether you understood what you read." Clearly you lack good reading comprehension bright boy, also note the fact that I referred to it as a mass murder. "In fact, you're the only one who's saying someone (the English) had a right to commit genocide. Since you're excusing the English invasion of Virginia, where exactly would you draw the line? Were the Indians ever justified in killing "settlers" who forced them from their land into poverty, sickness, and starvation? If so, when did killing settlers go from being unjustified to justified? Pick a point and defend your position." See the previous points I made, that's not what I was saying at all. Also it's a bit of an insult to accuse me of supporting English genocide when quite a few ancestors of mine were killed by English genocide campaigns (God only knows how many my family lost to the Cromwellian genocide). So 'grats on failing, yet again. "Nothing like the smell of stupidity in the evening. Repeat: My position is that violence is justified only as a last recourse, when all other options have failed. That position is the same regardless of who's committing the violence--whether it's Americans, Nazis, Muslims, or Indians." My position is that violence against combatants is justified. "If you want to discuss some situation where you think Europeans or Americans killed people only after their other options failed, let's do it. But don't waste our time fantasizing that my position would vary depending on who's doing the killing. Put up or shut up with actual case studies, not your ridiculous guesses about what I believe." Do you see the irony here? Surely you must. "What was achieved by all the peaceful accommodations the Indians made, the hundreds of treaties they signed, etc.? Other than the deaths of 98% of them, that is. Answer that and then I'll tell you why the Indians resorted to massacres when all else failed"
Simple; nothing just like this atrocity. "I've written about the various ways the Indians could've avoided defeat. They generally involved killing and warfare. The Euro-Americans were never going to give up unless they were forced to." I actually agree that Native defeat was not 'bound to happen'. "But if you can come up with an alternative, by all means do so. Tell us the nonviolent means by which the Indians could've kept their land." I honestly don't know, but that isn't the topic at hand. "We await your "expert" knowledge of history with bated breath." I never claimed to be a history expert, you on the hand have bragged about how much of an erudite you think you are. "And while you're at it, be sure to tell us what the Indians should've done at Jamestown. Assume they correctly foresaw what would happen in the next couple of centuries, when the English overran their homes and reduced them to beggars." No they should have just attacked soldiers. My post continues here because I ran out of space fyi. "According to you, they should've laid back and enjoyed it, eh?" No that's not what I was arguing, just that they should not have attacked civilians. If I was really arguing that they should have just taken it why haven't I claimed that Custer was 'murdered'? Little Big Horn is an example of a 100% justifiable Indian military action and it's a perfect example of self defense. "Below: "I have a woman and child with me. That means you can't fight back, you savage animal." Once again that's not my point. Also try to reply sometime this year mkay? "Maybe the Indians considered the women and children carriers of disease (i.e, "evil spirits"). This still doesn't excuse anything; not to mention the fact that wasn't that child's fault that he or she contracted a disease. And before you mention the 'Euros were filthy and Indians were clean' line I should point out that the Norse people were known were for their hygiene.